Can you see the air gun pellet in this x-ray? Occasionally when we radiograph animals, we stumble across incidental lesions, also referred to as “incidentalomas”. They’re not related to the current disease state but can indicate a previous disease or injury. Unfortunately, one not uncommon incidentaloma in cats is the air rifle pellet or slug. Take Fluffy (not his real name), a cat I was investigating for an ongoing cough. This lovely cat used to live in a peri-urban area where, as it happened, someone in the neighbourhood with a distinct lack of empathy decided to use him for target practice. His thoracic radiographs revealed the presence of an air rifle slug. Such wanton cruelty is pathetic and objectionable, but this isn’t a one-off case. I’ve seen other cats with the same radiographic findings. In a case series published in the Journal of FelineMedicine and Surgery, metal projectiles were found in 2.1 per cent of cats. That may not sound so high, but think about it. That’s two in every hundred cats with a deliberately inflicted injury. Almost 40 per cent of these cats suffered fractures as a result, but many did not show signs. Two-fifths or 38.5 per cent of cases in which metal projectiles were found on radiography were incidental findings. The majority (80 per cent) of projectiles were from air guns. Many cats had multiple projectiles, with almost one third of cats having metal projectiles in two or more body regions. This study looked at cases presenting to a teaching hospital during the 2012-2014 period. But the authors noted that not much has changed since a 1970 study, which found a prevalence of 1.7 per cent. “The difference of 44 years between these publications and the changes in shotgun regulations that have occurred in this period appear to have made little difference,” they write. Disappointing to say the least. Perpetrators may shoot cats thinking that the harm they do is minimal. This is incorrect. Air gun pellets can reach velocities comparable with other handguns, particularly when fired at close range They are responsible for catastrophic injuries to humans as well, with many eye enucleations (removals) and some fatalities attributed to air guns. Another risk is that un-diagnosed metal projectiles present a major risk to animals undergoing advanced imaging. If you’ve had an MRI you’ll have been asked to remove all jewellery, report any kind of surgical implant or prosthesis and empty out your pockets. This is because the M in MRI stands for magnetic, and the magnetic field is so strong that metal inside you will migrate – damaging tissue as it does so. 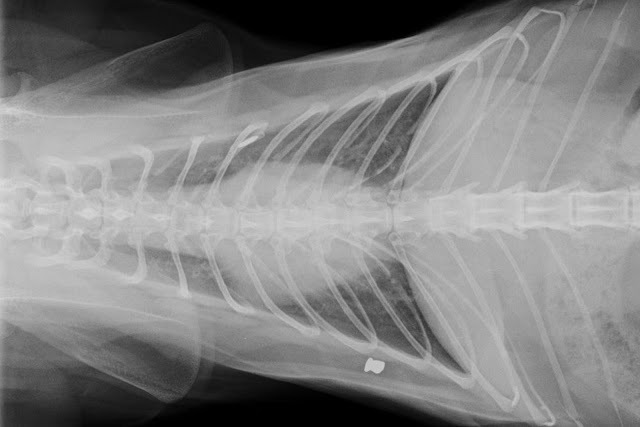 The authors argue that the prevalence of metal projectiles in cats is high enough to warrant full-body radiographs in any cat undergoing an MRI. Acts of cruelty towards animals in Australia can be reported to the RSPCA, the Animal Welfare League or the police, all of whom can prosecute offenders under the Prevention of Cruelty to Animals Act (or similar) in their State or Territory. Vnuk D et al(2016) Metal projectile injuries in cats: review of 65 cases (2012-2014) Journal of Feline Medicine and Surgery18(8):626-631.